One of the founders of Universalism in America. John Murray was born on December 10, 1741 in Alton, England, southwest of London. The oldest of nine children, John and his family moved to Ireland when he was ten to live in a village near Cork. The family was converted from a strict Anglicanism to Methodism, and John became the leader of a boys group who met to pray and sing. After Murray’s father died, John went to live with a couple named Little, whose large library led to new educational opportunities. Shortly thereafter, John returned to London, and took on a job in a cloth mill. Here he met Eliza Neale, whose grandfather despised Methodists. Despite his opposition, Eliza left his house, and married Murray. 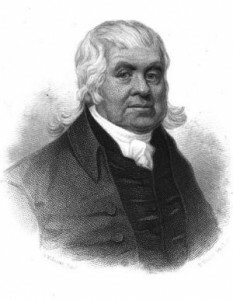 John’s leadership in the Methodist church was tested when he was asked to visit a woman from his church who had been converted to the universalism taught by a preacher named James Relly. Murray became disturbed by this visit, and decided to read Relly’s pamphlet, Union, and go hear him preach. He tried to divide his time between the two congregations, but the Methodists finally questioned him and found he had been converted to universalism. Unfortunately Murray’s new faith was tested almost immediately. He and Eliza had a baby who died at the age of one, and then Eliza died soon thereafter. Finally, he went to prison because he could not pay his debts. Relly urged him to preach after he was released from prison, but he found he had too much heartbreak, and resolved to discover a new life in America. In July 1770 he sailed for the New World, landing at Philadelphia, but then headed to New York. Before they arrived the ship became stuck on a sandbar on the southern New Jersey coast, near Cranberry Inlet in a place later called Good Luck Point. Going ashore, Murray met a man named Thomas Potter. Potter explained that he had built his own meetinghouse because he expected that a preacher would come who would declare that all people were meant to be saved. When Murray admitted to Potter that he had preached, Potter tried to convince him that he was the man God sent to fill the pulpit. Murray said he vowed never to preach again. Finally, Potter struck an agreement with him. If the winds did not change and the ship remained stuck on the sandbar, then it would be a sign from God that Murray was meant to preach there. If the winds changed then Murray could proceed on his journey. It had been two days, but by Sunday morning the winds had not changed, and Murray, keeping the agreement believing it was a sign from God, preached the first Universalist sermon in America on September 30, 1770. For the next few years, Murray became an itinerant preacher of universal salvation. By 1772 he had reached southern New England, and finally Boston in 1773. When he returned to Boston in 1774 a stone was hurled through the window where he was preaching. Murray picked it up and remarked, “This argument is solid and weighty, but it is neither reasonable or convincing.“ He was attacked with stones again in Gloucester, where a small group led by Winthrop Sargent, had invited him to preach. They had already been converted by reading a copy of Relly’s Union. In 1775, Murray left Gloucester for nearly a year to serve as chaplain to a Rhode Island regiment in the war. After his return he continued to preach. On January 1, 1779 a group of 61 people formed the Independent Christian Church in Gloucester. In less than two years a meetinghouse had been built. Soon thereafter the church was embroiled in litigation surrounding its legitimacy. Murray’s name appeared on the suit against the Parish Church in Gloucester which was attempting to tax the Universalists. This suit was finally settled in 1786 when the Universalists won the right to have their taxes support the church of their choice. Murray had to continue to battle state authorities over his ability to legally perform weddings, and this was resolved the following year, when his legitimacy and ordination (which occurred at the December 25, 1780 church building dedication) were confirmed by state legislature. In October 1788, Murray married Judith Sargent Stevens, a widow and the daughter of Winthrop Sargent. During the next few years Murray took a leading role in attempting to organize and unite Universalist churches, first at the convention in Oxford in 1785, and later in Philadelphia. Murray finally left Gloucester in 1793 to settle with the First Universalist Church in Boston, where he remained until his death on September 3, 1815.